At pH Nutrition we have 5 pillars of nutrition that we use. These are the principles that govern how we set up nutrition plans and what we educate people to focus on. Follow these principles to maximise your CrossFit performance. Focusing on FOOD FIRST is a non negotiable. Human nutrition is ensuring that most of your meals are from whole food sources, minimally processed and don't come in a shiny tub or wrapper. Jumping in a worrying about which supplements to take isn't going to help you achieve your goal. We underestimate the impact that eating enough vegetables has on health and performance. The intensity of CrossFit means that your body requires more support than the average joe. You need to be supplying it with a variety of nutrients. Always focus on real food first. Do the basics consistently. The simple stuff will have a larger effect on how you progress with the program than focusing on the 1%. If it seems too simple - that is good. You wouldn’t expect to jump straight into the main class and do 30 unbroken muscle ups. You have to develop the base skills and go through the PROCESS. The same goes with nutrition. Focus on the process of improving certain aspects and start to form good habits. Don’t follow someone's else's plan - evolve your own. Being aware of what foods work for you, when you eat and how you feel will allow you to build a sustainable nutrition plan. There are a few versions of this pyramid that you may have seen. This is our version and we will explain WHY we have structured in this way. All too often we see people invert the pyramid and start at the top wondering which protein shake to take and worrying about taking it within 10 seconds of finishing class. Just as we have spoke about focusing on principles opposed to methods we need you to focus on the bottom of the pyramid as these will give you the most bang for your buck. Getting an energy balance correct for your goal is the number one target when starting a nutrition plan. This is explained in more detail in the video as it can become complicated! This has a huge role to play in terms of nutrient density, micronutrients and inflammation. If the food we put in our bodies is of poor quality...this will equate to poor health and performance. Just like you wouldn't put crap fuel in a Ferrari, you wouldn't want your body to have to run on anything but the best. Next up is the ratios of protein, carbs and fats. In your nutrition guides we break this into percentages. Now we encourage you to start following our guidelines and then adjust based on your progress. This is all about trial and error. 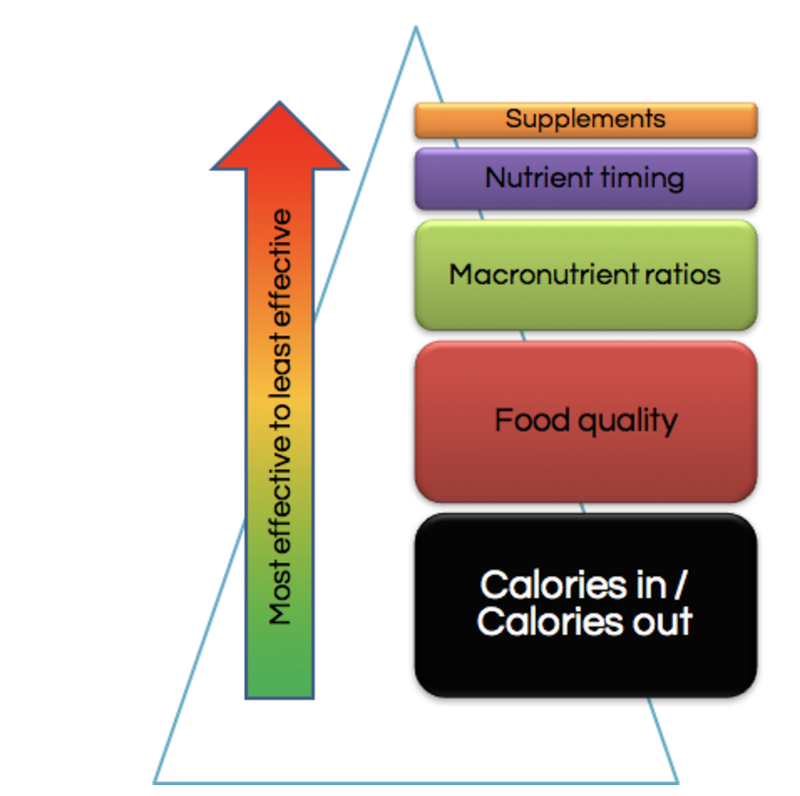 Nutrition is N = 1 so we have to play around with what works for you. Our tip is to keep protein intake relatively consistent and have carbohydrate and fats on a seesaw. More carbs = less fats. Less carbs equals more fats. The macro calculator will give you a great starting point. If you have not eaten a pre training meal (morning training) then ensure you eat within 30 minutes. If you have eaten pre training then ensure you eat within the hour post training. It is a balance over the day we are more concerned with at the start. The top of the pyramid...but something that we are all guilty of focusing on before doing the basics. Supplementation definitely has a place in your nutrition plan...just in the correct way.